Reader Gut Reaction: I remember reading Tiffany Trent's first Hallowmere book for the Cybils way back when, and I had enjoyed it much more than I'd expected to—I can't say Southern Gothic historical fantasy is my thing, but she crafted a fun and mysterious read that still lingers in my mind. 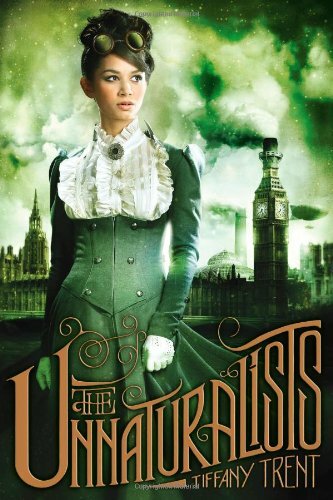 In this latest book, she's playing much more to my personal interests and quirks: imagine an alternate London—a science-worshipping, steampunk alternate London. Then add in a dash of magic here, a sprinkling of supernatural creatures there, and both the most appealing AND the most creepy aspects of Victoriana. Oh yeah, and witches. SECRET witches. Concerning Character: We start the story from the viewpoint of Vespa Nyx, who works with her father in the Museum of Unnatural History in New London. Yes, that's "unnatural." She helps her father catalog and mount specimens, kind of like a naturalist—only what they're preserving for display are things like Sphinxes, kobolds, and sylphids, which are a bit like tiny fairies. (Pause to envision Brian Froud's slightly twisted Lady Cottington's Pressed Fairy Album…) The only bad part about her work is that she has to deal with her father's creepy assistant, Charles. Then she finds out that her father's working on something very secret, something that could endanger them all—or save them. And there's something secret about Vespa herself, too…something even she doesn't know. Meanwhile, out beyond the confines of the city of New London, a boy named Syrus lives with a band of Tinkers in a disintegrating train yard. The Tinkers embrace the Unnatural as an integral part of the world, unlike the New Londoners, who see the Unnatural creatures as mere curiosities, dumb animals…and the Tinkers themselves as a labor resource to be exploited at will. (Pause to ponder rather depressing sociopolitical/environmental message.) When Syrus' and Vespa's paths cross, events are set in motion, and eventually they realize they need one another's help to save their respective worlds—and the world they share. Recommended for Fans Of...: Other steampunk-fantasy-ish books set in a reimagined historical time, like the Flora Segunda books by Ysabeau Wilce, Leviathan et al by Scott Westerfeld, Mortal Engines or Fever Crumb by Philip Reeve, even the Monster Blood Tattoo books by DM Cornish. Cover Chatter: This cover is just plain nifty. Although the protagonist is supposed to have Tinker blood and the cover model looks more Asian, it's certainly in no way been whitewashed. Plus: fab Victorian outfit, Big Ben's been turned into a factory smokestack, and the title font couldn't be more perfect. Win! You can find The Unnaturalists by Tiffany Trent online, or at an independent bookstore near you! Honestly, the writing style is really different from Monster Blood Tattoo (which I enjoyed, too) but that sense of a world inhabited by both humans and semi-mythical creatures, and the idea of misunderstanding between the two worlds, makes me put them in a similar vein. Also, the steampunk bits and the whimsical names...reading this one was sort of a "wish I'd written it!" experience.